It's time for one of my favorite ways to learn about new-to-me books to read, which also means that it's time for me to start hearing The Who singing "Who Are You?" in my head. "Arthur Prescott is happiest when surrounded by the ancient books and manuscripts of the Barchester Cathedral library. Increasingly, he feels like a fish out of water among the concrete buildings of the University of Barchester, where he works as an English professor. His one respite is his time spent nestled in the library, nurturing his secret obsession with the Holy Grail and researching his perennially unfinished guidebook to the medieval cathedral. Bethany soon joins Arthur in a quest to find the lost Book of Ewolda, the ancient manuscript telling the story of the cathedral’s founder. 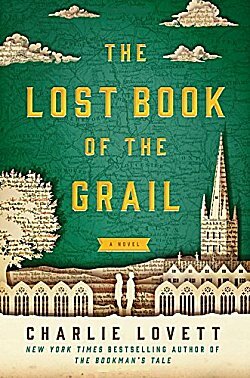 And when the future of the cathedral itself is threatened, Arthur and Bethany’s search takes on grave importance, leading the pair to discover secrets about the cathedral, about the Grail, and about themselves." Arthur is a curmudgeon, and I can be, too. Arthur is obsessed with the Holy Grail, and when I was in college, I was rather obsessed with King Arthur and "all that jazz," too. As Arthur, my favorite place is the library of an ancient cathedral amongst its priceless manuscripts, and I can see that being one of my favorite places, too. Arthur and I share so many likes and dislikes that it makes reading this book an absolute delight-- almost as though I'm actually living the action in the book as I read. I'd really like to know! And please don't forget to tell us the title of the book so we can all add it to our wish lists! Oh, that does sound interesting, Cathy! As for me, I've a few books going right now, and I don't want to clutter up the comments section. I do love this feature, though! It's a shame you couldn't have chosen one. Ohhhh... I think I'm going to have to look this one up. Sounds fab. I don't have anything in common with him either-- except that pesky love of food-- but I can't stop reading about him! Hello! My name is Susan Ryeland. I work as an editor for Cloverleaf Books. I was planning to spend the weekend reading the latest mystery by Alan Conway. He writes the popular Atticus Pund series which is in the style of the golden age mysteries. He has many puzzles planted in his novels. I don't like Alan very much but he makes money for our company. My boss deals with him personally which is perfect for me. What a surprise I had when I came to the end of the novel. It was missing the ending chapters. So I am off to find them. Something unexpected happens so I am now trying to solve two mysteries. I well remember when it was my turn to be Susan Ryeland! 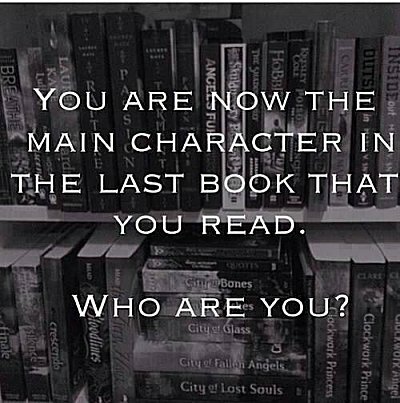 Well, I've never been a male character or a federal agent before, but here goes. I am Aaron Falk, a federal investigator, who leaves Melbourne and goes to my childhood hometown in southern Australia to attend the funeral of a friend. And then I'm asked to investigate his death and the deaths of his family members. At the same time, I'm being harassed, and trying to solve the 20-year-old disappearance of a teenage girl who was a friend. I see that the town is in bad shape due to a drought and therefore economic disaster, as crops can't be brown and sold. And people are moody and depressed. I do find out the truth about both the current and past mysteries. And I wonder whether I'll keep on doing investigations here or go back to Melbourne to continue working as a financial investigator. Correction: "crops can't be grown." Oy, yes, The Dry by Jane Harper. She has a second one nearly ready to publish with Falk.